Sheilagh McLean has always prioritized her health and fitness. As a yoga instructor who works primarily with retirees, she teaches others the importance of putting health first in our later years. With an extensive background in fitness, Sheilagh "walks the walk". She’s been involved in pilates, yoga, dance, running and had experience with weight training as well. Things have always gone pretty well for Sheilagh when it comes to her health. One day after overcoming a flu (which was not typical of her) it came to focus that she didn’t like the downhill slope she saw ahead of her. She'd stopped dancing due to a foot injury and was uncertain as to whether or not she would need to have surgery in the winter. It became clear that she would have to fight back to avoid the slope that included chronic injuries and getting out of shape. At 68, being able to take care of herself and others is her main goal. She noticed that what she was already doing helped her to a point, but in order to reach her goals she would need something different to maintain her independence. 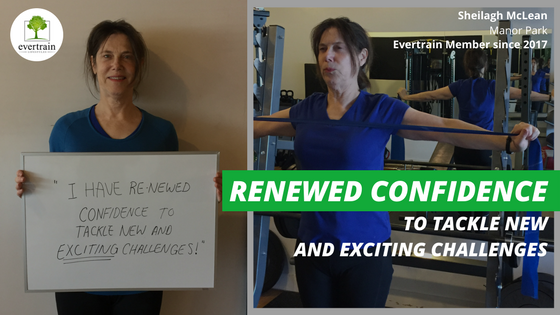 Over 6 months later, Sheilagh has received the benefits of being an Evertrain member. Sheilagh has gotten stronger throughout her body, her clothes fit better, she has become more resilient (both physically and mentally) and has re-newed confidence to take on challenges that she may have never considered before. As a Manor Park resident, Sheilagh noticed the studio that Evertrain works out of. One day she decided to walk in to gather more information. She learned about our speciality of working with people over 50 and how we emphasized injury prevention. The focus on training for people 50 plus was what prompted her to take the next step. After an initial consultation, Sheilagh determined that there was a great fit. For her goals Sheilagh’s coach recommended committing to the 12 month LeanAfter50-VIP program with in-person training once per week. Sheilagh works to regain strength in her hips with a single leg deadlift. At first, she hesitated. 12 months of anything is a big commitment. After having a few questions answered, she realized that this was a commitment to her own health and future. She knew that Evertrain was a good fit for her and she was excited about getting started. Sheilagh would have to commit to revisiting nutritional and lifestyle changes (even though she was already in a great place starting out). She would commit to fitting in 3 weight training sessions per week (one with her coach) and going for walks or performing her yoga practice on other days. When Sheilagh first started with us, she was dealing with some lower limb issues. Both the toe and knee were areas of concern and we had to start slow. Her program focused on total body mobility and basic movement mechanics with an emphasis on hip and core strengthening exercises. Working towards a strong upper back has helped improve posture and increase upper body strength. She makes sure to “show up” every day to get in her workouts and to work on whatever habit she is currently focused on. She stayed focused on the big picture and was determined to be consistent. Days became weeks. Weeks became months. Before you knew it, Sheilagh was feeling great about herself, her abilities, she had lost 6lbs and her clothes were fitting better than they had in a long time. She felt like Superwoman! Everything was going great with this new routine and new found strength and energy. Over the winter, Sheilagh faced a serious set back. A close friend of hers passed away and she was left with a major role in dealing with the estate. Her part in clearing the apartment involved lots of heavy and awkward lifting, carrying upstairs and across icy driveway. With the fatigue and strain that came with this, Sheilagh’s back went out. She was experiencing allergic reactions, exhausted, overwhelmed, and injured. During this time, Sheilagh and her coach scaled back expectations and had her follow the program in a slightly modified way. She wasn’t “perfect”. Instead she did what she needed to do to stay on track, until she could build herself back up. With determination and guidance from her coach, Sheilagh has proven to be one of the most consistent members we’ve had. In spite of whatever set back may come around, Sheilagh finds a way to take action. Being able to take consistent action, although imperfect, is what it’s all about. Sheilagh gets that. Today, Sheilagh feels more confident. She feels by and large much better and people who she hasn’t seen in a while have been complimenting her. After a recent doctor’s visit her blood tests are all normal. Sheilagh is planning to take on new challenges in the future as she becomes more involved politically and in her community. About half way into her program, Sheilagh’s future is bright. Overall, she feels capable, resilient and well equipped with the right tools to take on the challenges of the future. Accountability and personal coaching have been the biggest factors for Sheilagh. She loves having something to do every day. Although not too time consuming, the daily tasks keep her grounded and on track. Her coach is helping her to learn things about healthy living and exercise that she may have never learned. If you would like to learn more about a coaching program like the one Sheilagh is on, simply click the link below. We would love to speak with you on how we can help you overcome obstacles and reach your goals.